Surfing Surgeon Stuck in the Sand: Gear, gear, and more gear! Our team is coming together! We have a total of 26 people in our training class, 18 of whom are going to Qalat. We spent the day today in gear issue. Gear issue is a really incredible thing because just when you think they couldn't possibly have anything else to give you there's more! 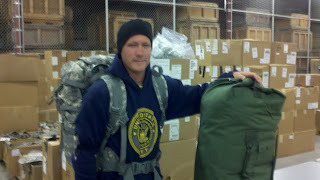 We all got an initial gear issue of about a seabag worth of gear before coming to New Jersey. That consisted of all our basic uniforms and a couple pairs of boots. Today they gave us an incredible cold weather clothing system, eye protection, a sleeping bag system and huge rucksack plus all or our body armor and another pair of boots... and that's just the "big stuff". I have no doubt that it's very unlikely I'll use half the gear they gave me but it kind of gives you a warm fuzzy feeling to know that your needs are (mostly) covered. Of course, the downside to all this gear is that you have to take it with you... ALL THE WAY TO AFGHANISTAN! Looking at all the stuff I have to take, it looks like I'll have a huge rucksack, three seabags, and a computer case. Oh, and two weapons. Tomorrow we have a fun-filled day of lectures. Rights and responsibilities, suicide prevention, sexual harassment, etc. We will slowly be easing into actual field training over the next week. I look forward to driving the Hummer, shooting, and just running around! It'll be cold, wet and strenuous but it beats sitting in lecture! Overall things are really good and I'm glad to actually be ticking days of my time away from May and the kids off the calendar instead of counting down the days 'til departure. Stay tuned for more from cold and snowy Fort Dix! P.S. Mom loves you too - Hope all is well Eric. I've been thinking about you.